Sometimes you get rewarded late…. so late that all gear was stowed away as I was on the return leg after a fine, yet far from spectacular – at least from a photography point of view – climb up to Turlough Hill in the afternoon. While a beautiful day it was, the sun shining sky high throughout, the oh so often elusive yellow ball did vanish behind a tick layer of clouds as I prepared for my carefully selected sunset shot. One of those days, it seemed. Nothing you can do about it. As I set sail before darkness hit, all of a sudden the world around me turns into a vibrant orange, red and purple wonderland. Gone is the layer of clouds, free is the sun, minutes away from dropping behind the back of Turlough Hill. A sunset photo at last! After passing the site multiple times in recent weeks (and didn’t find it instantly when actively looking for it either), today there was no stopping getting to the top of the Hill of Allen! To find the site, even more so to find parking, is an adventure in itself. Don’t expect signs, and don’t expect the small car park that exists in theory to be open either – the site is officially not open for public any more as quarrying takes place at the other side of the hill. It it still possible to go up, though. A small, muddy way leads all the way to the hill. A shame the county council has effectively abandoned this site of historical importance as it could be a real gem – if protected and cared for. At the top of the tower has been a glass canopy erected a few years ago. Unfortunately this one has been smashed and glass is scattered as wide as the eye can see. If you squeeze through the open frames you’ll be rewarded with the most magnificent view over county Kildare, the Curragh all the way up to the Wicklow Mountains in the distance, nonetheless. It’s well worth the effort. It looked simple enough on the map. The reality was steep. And windy. At least not rainy. That was for later. Hiking up to the Djouce Mountain in the Wicklow’s isn’t a big deal, though the last bit is steep enough for untrained legs. Add some high winds and it makes for a stern test on a weekend’s afternoon. It was too windy up there and the looming rain clouds made sure I only stayed for a brief period until making my way down again. Light was sparse, though the shapes of the different mountains, hills, the wide panoramic view of the Irish coastline makes for an image where you can’t do much wrong. The wonderful 8-16mm from Sigma in the back delivered once more. I wanted to capture the atmosphere felt on the mountain in a wide panorama to show the contrasts of the scene. It’s not the most special image I’ve ever taken. Still, It was worth to get out there and take it. 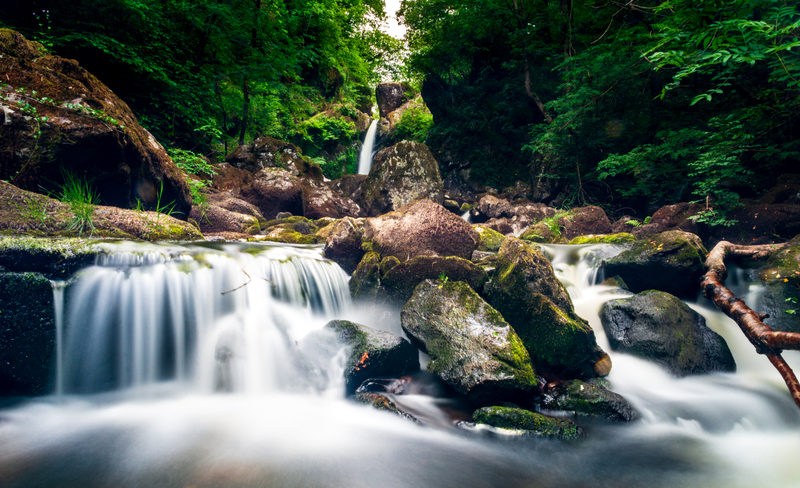 Rain soaked, covered in mud, the shoes filled with ice cold mountain water, the legs hurt, the lungs make strange noises….but it’s totally worth it! Because up here there’s nobody else. It’s only you, the rain, the wind, the sun and the odd double rainbow! I just survived the latest downpour in my quest to concur Mullacor Mountain – one of the easier hikes in the Wicklow Mountains National Park – in dismay I look at those heavy rain clouds which made my last half an hour so miserable. But then, suddenly and certainly out of nowhere, the sun is back! In fact, at the exact place where only minutes ago I was cursing mother nature, now a glowing stream of vibrant colours forms the most stunning double rainbow. It’s those moments that are reward for the one who makes the effort to go out into the wild, to explore what the world around us feels and tastes. At the same time it makes me realise – quite literally – that day in day out I’m actually just sitting in front of a brightly glowing screen and start losing a sense for the real world out there. So, memo to myself: go out more often! Let’s try this right away……. 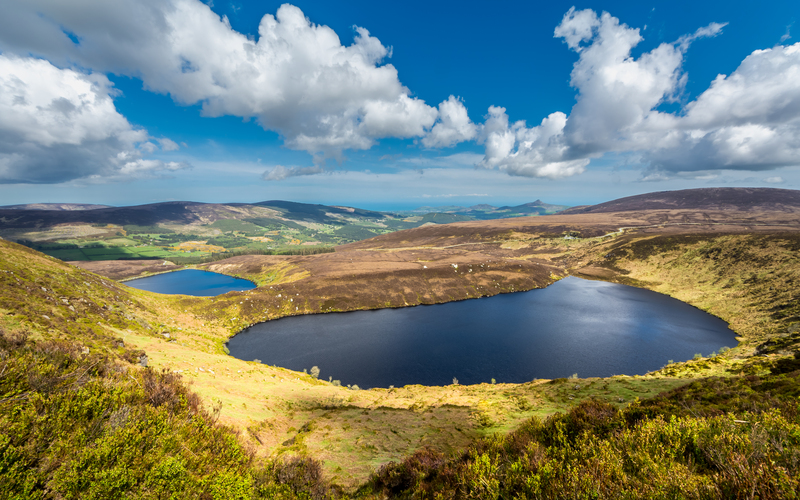 Lough Tay in the Wicklow Mountains National Park – also known as the Guinness Lake… with plenty of of phantasy it shapes like a pint of Guinness, though the northern coastline forms part of an estate in fact belonging to the Guinness family!